The most likely use of this command is to skip sectors you do not need in order to speed up the copy operation. For example, you may have a 500 GB hard drive but the partition of interest occupies the first 100 GB of the drive. You can omit sectors beyond the end of the partition. Another use, even though much less likely, is to instruct Disk Recoup to skip certain bad media spots you already know by other means. Disk Recoup can intelligently determine these spots while copying data. However, this information may help to avoid unnecessary delays. The source (i.e., faulty) hard drive. 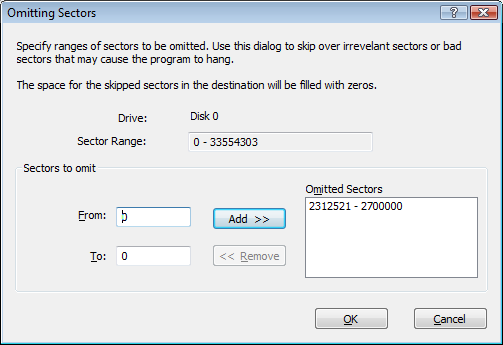 The valid range of sector numbers for this drive. Specifies the first sector of a range to be omitted. Specifies the last sector of a range to be omitted. Adds this range to the list. Removes this range from the list. Ranges of sectors to be omitted.